Exhaust options for the FZ/MT 07 appear to be limited to 2-1 with the exception of IXIL who makes what appears to be a 2-1-2. I haven't really checked on that exhaust so forgive me if I'm wrong. It's been mentioned -either here or another forum but I believe here- that a 2-2 is the better setup due to the uneven firing order of the 270 crank. I've tried searching the web for more info but haven't really come across anything. I believe options are important to open up and personalize. Is a 2-2 better? If it is, then maybe the 07 community can push the aftermarket for it. I see a lot of v-twins using 2-2 and being 270's act comparable to them it only makes sense to wonder why the aftermarket hasn't put any out for the 07. Not to mention I have found other 270 parallel twins do have 2-2 available. I leave this to the knowledgeable people here. Pros and cons? I know it comes down to the uneven firing order, gas and wave pulses effecting exhaust scavenging and promoting cylinder fill on intake stroke. If gas and wave pulses are off it can actually interfere with efficiency. Does unequal header length combat that on a 2-1? Sorry for the long post. Understand that I don't want this to turn into another one of "those" exhaust threads. Merely educational here. Thanks guys and gals! I'm not too versed on the subject and don't know much here, but @gregjet has been rampant on the forum about this lol. I also was holding out for a 2 into 2 exhaust that I didn't have to fabricate myself. I might have to give up on that though. I am modifying my stance a little about 2-2 after getting a post by another member that led me to the new Divergent close to head exhausts that have started appearing. The Arrow APPEARS to be such an example, my Akros are not. Even though the best example I have seen on a motorcycle is on the YZR M-1 MotoGP bikes and are made by Akro. Still , if you are making a straight pipe exhaust 2-2 is still the go unless you have access to the new maths they are using for the current close reflectors. "longer is better" is not quite right. On the MT, longer than straight underneath is better unless you build with tiny ID pipes ( a bit pointless). The lower the revs for the peak you are after the longer the pipe an the MT is relatively low rev peak. If you are using the bike on the road, you don't need ultimate power and the pipes the right length and pulse tuning will only work at the peak rpm you design the system for. Any light weight pipes you like the look of will be fine for the vast majority of riding on roads. Track , however, where you want every tiny extra pony, go for Arrows or 2-2 IMHO. Have a look at Ducati v twins. Same firingpiston offset. All performance have 2-2.
ill see if they know anything, or have any contacts that might. I would prefer for a 2-into-2 to have both pipes on the same side on top of one another, like on the newer Ducati's. It looks more modern to me. Under the seat would be even better, but that is just a pipe dream lol. Something like this but instead of the 4, just have 2 slightly larger pipes in the middle? 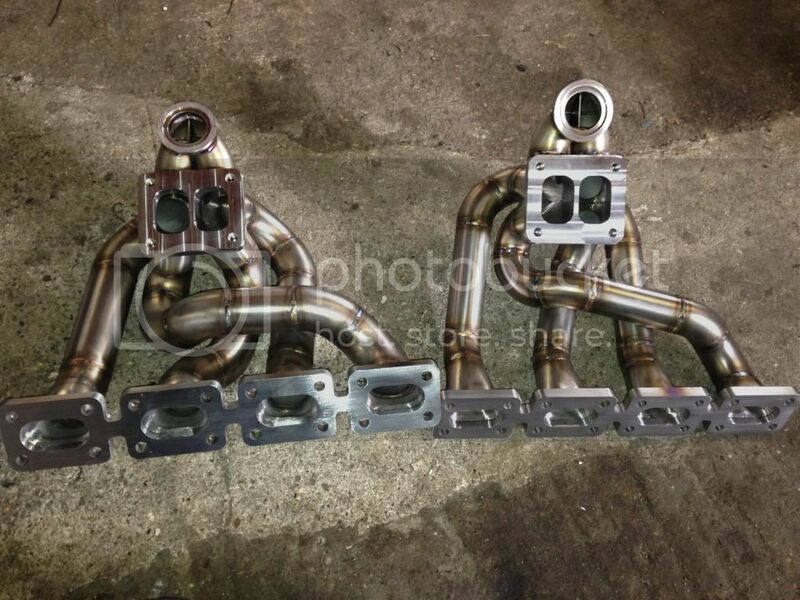 Here is a properly designed twin scroll manifold for my car. The pulses from the cylinders are seperated all the way to the turbo and the turbo its self also has a divide in it. The problem with the MT07 pipes joining is the fact that the crank is "cross-plane" ie at 90degrees. This makes the pulses extremely problematic because of the phase relativity. It is the same problem as a 90deg Vtwin. Would this not be reduced by the length of the headers? Without the exhaust cam timing we are all just guessing. If we can get those, we can get a real length is seconds. We already know the peak HP revs. I would be easily convinced that, considering the powercurve of the MT/FZ, 49" is a reasonable guesstimate. The ER6 was 42" and it had higher peak revs so would be probably be shorter than the FZ/MT ( depending on cam timing). Where the pipe ends can be mitigated somewhat by curves on the way from the head. Benelli and the ER6 have some interesting wiggles to keep the pipe end furthur forward. Akra Carbon uses a snail pipe. If I were racing it , it's one of the first things I do, but those days are unfortunately gone. I will get around to it one of these days just for interest sake. With a 2 into 2 exhaust would you need 2 oxygen sensors, 1 in each pipe? With only 1 oxygen sensor, the computer would only be reading the air fuel ratio of 1 cylinder instead of an average of the two. I wonder if this is a problem? I have some fabricating skills and own a TIG welder, so I could do something custom if I wanted something different. Speaking in very general terms, I've never seen an uneven-firing twin run "better" with a true 2-2 exhaust, and I have tuned a ton of them. Oh, you might be able to squeak out a few more peak hp but it always comes at the expense of midrange and low-end. They really like some sort of x connector or simple crossover to smooth out the power. In particular I've worked a lot with Honda Hawk exhausts, which doesn't fire quite like a 90 degree twin but it's close. (232/488 vs 270/450) They are quite insensitive to header length. They are VERY sensitive to what happens after the collector. (just as the EPI article suggests) Ducatis are like this too. That's where I would focus my attention on the FZ- tailpipe length and diameter. Just my two cents. Looking at some of the Ducati's, it sure seems they are not true 2 into 2. 2 pipes into 1 and then back to 2 pipes. I found exactly that on my old tuned 650 Bros (Hawk) years ago. Finished up making a crude Trombone type affair aft of the collector. Then lots of dyno runs with the trombone adjusted to various lengths to find the best power characteristics. The vast majority of Ducati exhausts are 2-1-2. Some look like a 2-2 but they have a crossover of some sort.